Brussels sprouts, broccolini & scallions tossed with a tangy & spicy citrus sriracha dressing and topped with creamy avocado! (Gluten-free, Vegan option). I’m pretty sure this one covers all of my major food groups: green vegetables, avocado, almonds, mint, lime & sriracha. In fact, I could probably stop right here and live happily ever after. 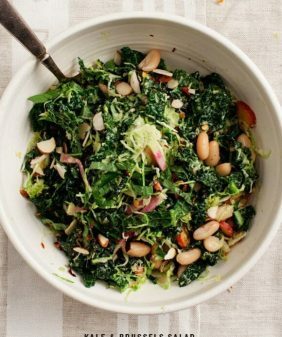 I could change our name to The Brussels Sprout Blog and take pictures of this dish – every day – just in a different bowl (you know, to keep things exciting). Of course, I’m kidding, but I do really love this combo. 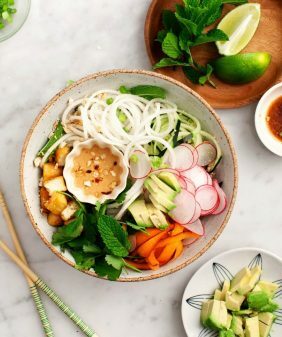 What really pulls it together is the fish sauce (don’t worry, if you’re vegetarian you can sub it out), but it really brings the most amazing salty-rich flavor to the bold, tangy dressing. And it’s perfect with brussels sprouts. Feel free to add (or omit) any grain you want… I happen to be in love with forbidden rice right now. It’s healthier than white rice and it conveniently takes SO much less time to cook than brown rice. Dressing inspired by this one from Food 52 which was inspired by David Chang’s recipe in the Momofuku cookbook. Whisk together dressing ingredients and set aside. (You can take a taste but remember that it might seem a little strong - it'll become more tame once it's on the brussels sprouts and everything else). Heat a large skillet over high heat. Add a few teaspoons of oil. When it starts to sizzle add the brussels sprouts, cut side down (or as many as you can get cut side down quickly), with a few pinches of salt. Don't touch them for a few minutes until the cut-side starts to turn golden brown (turn one over to check). Once they have a good sear, flip them over, add the broccolini and continue cooking until tender, but not mushy. At the very end, toss in the scallions. 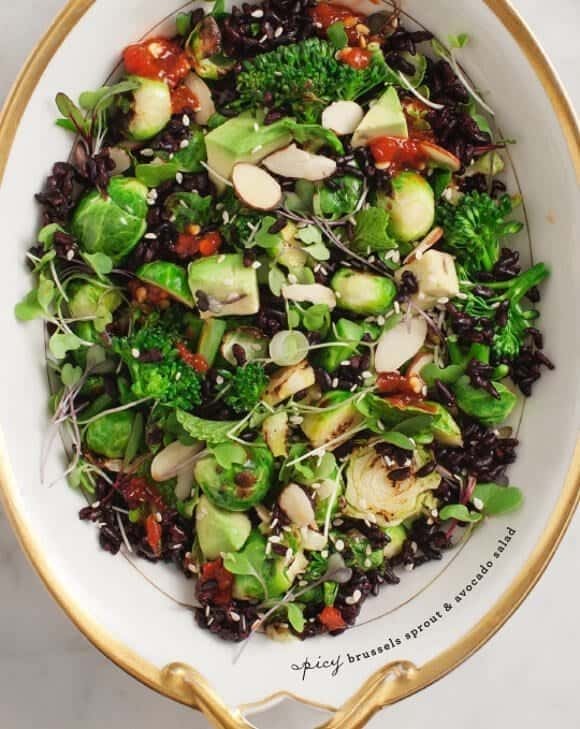 Toss the brussels sprouts & broccolini with the black rice, sliced avocado, mint, almonds, sprouts, and sesame seeds. Taste & toss with more dressing. Serve warm with extra lime slices and more sriracha if you like. Vegan/vegetarians: sub soy sauce or tamari for the fish sauce, but add only 2 tablespoons, not ¼ cup. (you can always add more, to taste). Mmm this salad is FILLED with goodness!! Looks awesome! That dressing sounds delicious. I love anything salty-sweet! Especially when it comes to Asian flavors. 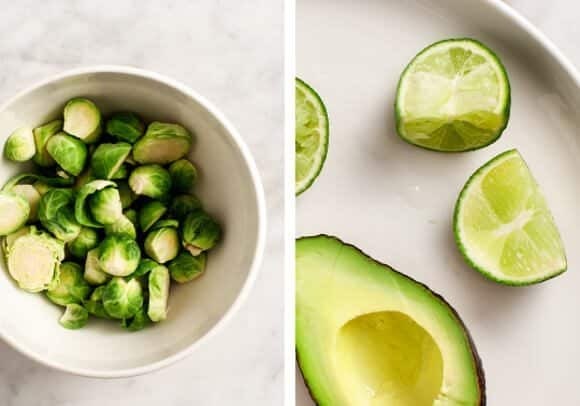 I would have never though to mix brussel sprouts and avocados together, but this looks and sounds amazing! 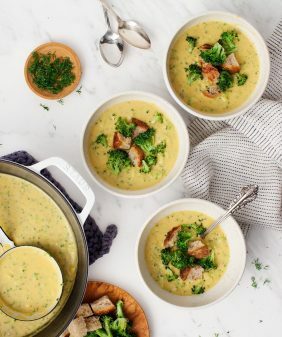 You should try it – I love the contrast of the creamy texture (especially if you can get your brussels sprouts crispy). Ooh yes! I think you and I are equally passionate about brussels sprouts. This salad is making my mouth water! The freshness of this recipe is exciting and lovely. What a gorgeous salad! I love the idea of combining two hardy winter veg with a tangy, salty, herby dressing for maximum flavor punch. Hooray! Yum this is my kind of salad. Delicious. I’m on this crazy new diet, well, really a lifestyle change, which involves little to no grains, no sugar, and no dairy. Your blog has been a lifesaver! I can eat incredibly delicious meals AND stick to my dietary restrictions. My hubby and I thank you! What a gorgeous salad. 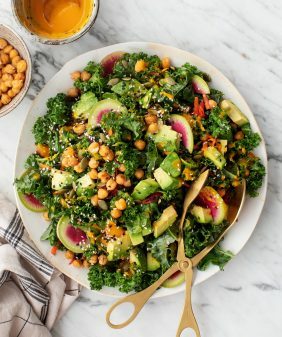 I’m really trying to like brussell sprouts…maybe I’ll shred them but I want to try this lovely salad. What a beautiful dish, not to mention sounds right up my alley. I love experimenting with brussel sprouts! Zoinks! How I love dear, dear Brussels sprouts. This looks amazing. It’s like you took everything in my fridge and dumped into artfully into a perfect salad. I could see myself eating myself silly on this. The Brussel Sprout Blog – love it! I love anything avocado, looks great! Sriracha is absolutely my favorite food group. Love me some chopped salad, especially with an Asian flair. A must try! Crispy Brussels sprouts and creamy avocado – what a combination! Can’t wait to make this next week! It’s almost as if you crawled inside of my head with this blog. Every recipe you post sounds like the perfect meal to me. This one especially! Just made brussels sprouts tonight and um . . . they were awful! I am determined to find a way to make this vegetable! I am trying this next. It sounds and looks yummy. Crossing my fingers! Made this tonight and loved it! 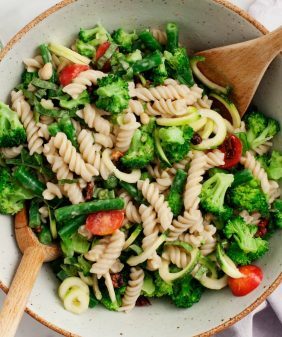 Just one minor tweak – substituted red quinoa for the rice and used broccoli as I couldn’t find broccolini. 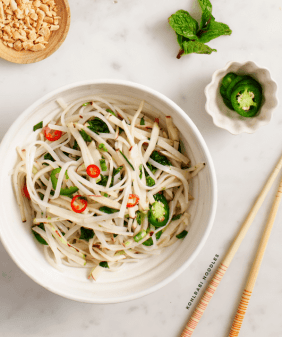 Fish sauce can be a daunting ingredient to some, but it was fabulous in this salad! Hi Cam, I’m so glad you liked it, thanks for sharing… glad you liked the fish sauce! Can’t wait to try this! I love brussels sprouts! What a great salad! I love fish sauce but my husband hates it. Any substitute for it? It’s been called nasty, detestable, obnoxious, sad, sour and soggy. But the Brussel Sprout is a “trending” vegetable. Easter is a perfect opportunity to incorporate this new food status symbol into your life! Such beautiful food you show! Love you guys! That’s good for my health! Thank you with your introduction from step to step to make the delicious meal!